The CN2300 series has been discontinued. Some models may still have remaining stock. Please see the CNPT Series as a possible alternative or contact our sales department. The CN2300 Series 1/4 DIN profile controller with graphic/text LCD display and USB interface is an affordable temperature and process controller with advanced functionality including datalogging options. Designed to improve user efficiency many features are integrated to reduce commissioning time, simplify operation and minimize maintenance downtime. Features include graphic easy to read backlit LCD display, dual color screen (green/red), multi-language option, custom splash-screen on startup (bitmap file), alarm status view, on screen trend view, LEDs to indicate heat, cool, autotuning and alarm. Easy setup wizard (via front keys) for quick configuration of inputs, alarms, outputs, communications and real-time clock. Universal input for thermocouple, RTD’s and linear DC process signals (mA, mV or V). Flexible modular output options include mechanical relay, dc Pulse, AC SSR triac and linear outputs. Select to precisely match the process, digital input (2 max) for setpoint selection, profile control, datalogging start/stop, control output enable/disable or auto/manual control. The CN2300 series features configurable menus (using optional software with cable for configurating units via RJ11 configuration socket), USB port for local upload/download of configuration files and download logged data to or from a USB memory stick. This allows easy configuration of multiple instruments by copying from one unit to another. Profile feature includes 255 segments to allocate freely in up to 64 programs. Programs include ramp, soak, hold, loop or jump to other profile. User defined text profile name, delayed or real-time day/time profile start, and up to 5 event outputs. 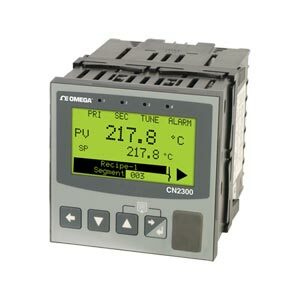 The CN2300 datalogging models include historic process data for analysis or reporting, and export data files via front USB or optional communications, and will log process values, setpoints or alarms (including minimum, maximum and average), with logging intervals from 1s to 30m. Many options include analog remote setpoint, built in 24 Vdc transmitter power supply, and graphical software. Sensor Break Detection: 4 to 20mA, 2 to 10V and 1 to 5V ranges only. Control goes to pre-set power value if Aux Input is the active setpoint source. Alarm Types: Up to 5 alarms selectable as process high, process low, band, deviation, rate of signal change (per minute), sensor/input break, loop alarm. Band and deviation (high or low) alarm values are relative to the current setpoint value. Alarm Hysteresis: A deadband from 1 LSD to full span (in display units) for Process, Band or Deviation Alarms. Rate of Change Alarm hysteresis is the shortest time (1 to 9999 seconds) the rate of change must be above the threshold for the alarm activate, or fall below the threshold to deactivate. Trend View: 120 of 240 data points shown in a scrollable window. Data is not retained when power turned off or if time base is changed. Targeted Peripheral: USB Memory Stick. Isolation: Reinforced safety isolation from all inputs and outputs. Recording Memory: 1Mb non-volatile flash memory. Data retained when power is turned off. Recording Capacity: Dependant on sample rate and number of values recorded; Two values can be recorded for up to 7 days at 10s intervals. More values or faster sample rates reduce the maximum duration. Segment Time: Maximum segment time 99:59:59 hh:mm:ss; Use loop-back for longer segments (e.g. 24:00:00 x 100 loops = 100 days).